All the great painters of the German Renaissance, including Mathis Grunewald (ca. 1470/75-1528), Lucas Cranach the Elder (1472-1553), and Albrecht Altdorfer (ca. 1490-1535), had remarkable artistic personalities. This was partly conditioned by their environment, where they were quite rooted. The fact that they often held positions in government, as did Cranach and Altdorfer, also contributed to this geographic stability. Durer stands out among them not only for his artistic value, but because he was the only one who, without ever interrupting his own artistic activity, traveled to Italy and the Netherlands to search for new stimuli and experiences. Hans Holbein the Younger (1492-1543) also traveled: he went to France, Lombardy, and England. In England, he entered into the service of Henry VIII, where he remained until his death. However, he is an exception among German painters, and, in any case, he is younger than the artists mentioned, coming almost a generation after Durer. Durer was born in Nuremberg, 21 May 1471. His artistic formation and his travel routes were affected by different circumstances, though they were largely determined by two factors: the central geographical position of his city—which favored commercial, cultural, and artistic relationships; and his family. His father, whose name was also Albrecht, was a respected goldsmith of Hungarian origin who, after having traveled and worked for a certain period in the Netherlands, settled in Nuremberg in 1455. Here he began to work in the workshop of the goldsmith Hieronymus Holper, and married his fifteen-year-old daughter, Barbara. He inherited the workshop after Holper's death, following custom (see the portraits of Durer's parents). The portrait of Durer's mother (1452-1514), together with the portrait of his father, also called Albrecht, was part of a diptych that appears as number 19 in the 1573-74 inventory owned by Willibald imhoff, a Nuremberg patrician. This inventory also brings to light that the two portraits were acquired by Ursula Durer, the widow of the painter's brother Endres. The portrait was seen again in Nuremberg by Carel van Mander, as is recorded in his 1604 Schilderboek. It disappeared in the middle of the seventeenth century, to be rediscovered as the portrait of Barbara Durer only in the mid-1960s at the Germanisches Nationalmu-seum (Brand Philips, 1978/79). The museum acquired the painting from Munich's antique market in 1925. It came from the collector of Durer's drawings, the Frenchman His de la Salle. There are several indications that it is the painting of lmhoff's inventory. The number 19 (that is, the one corresponding to the place in the inventory), is painted on the reverse side. It is found on top of an image of a devil who takes shelter in the crack of a rock, between clouds. Furthermore, these clouds are identical with those appearing behind the coat of arms in the portrait of Barbara's husband. 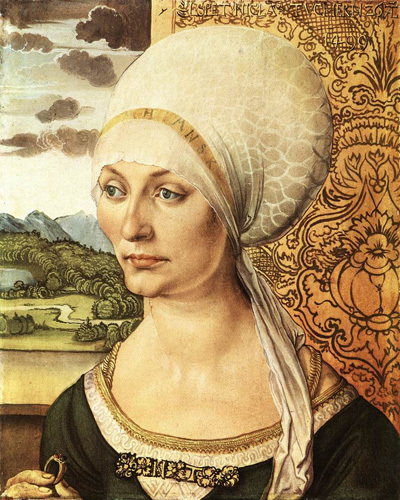 The presence of the devil can only be interpreted as an image to contrast with Barbara Durer. Since Piero della Francesca represented the triumph of virtue on the reverse side of the portraits of Federico da Montefeltro and of Battista Sforza, it is plausible that Durer, painting on the reverse side, had wanted to represent the devil, driven out by the virtue and faith of his mother (note the rosary that she holds in her hands). It could be a slightly different formulation of the theme of the triumph of virtue over vice, which will be treated on subsequent occasions. 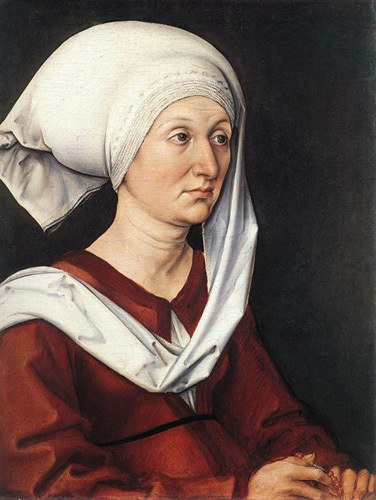 If there are any lingering doubts that this is the portrait of a thirty-nine-year-old woman, mother of sixteen, as was Barbara Durer, one should remember that the portraits of women were generally much more idealized than those of men. In addition, the idealization could act as a final homage to her virtue. 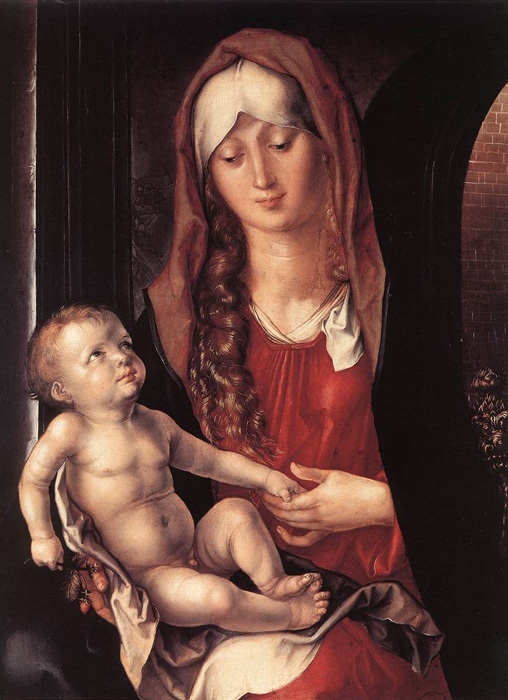 Durer shows that he does not yet have a perfect mastery of perspective in the painting (note the left arm of the mother). Even the folds of clothing are represented somewhat schematically; on the other hand, his extraordinary realism is already demonstrated by the clear, flesh-pink of the face and the white bonnet with the fallen tip. The sleeves and the hands are only partly seen, according to the portraiture conventions of the day. The color of the background is neutral. The pictorial tradition of his teacher is still present. Note, in this painting, the resemblance of the mother's head to that of the Magdalene under the Cross in the Lamentation of Michael Wolgemut of 1484-85. The portrait of Durer's father (1427-1502) is found, in Willibald Imhoffs inventory, at the same number as the one of his mother. Separated from the latter, it was sold to Emperor Rudolph II between 1588 and 1628. Prior to 1675, it was part of Cardinal Leopoldo de' Medici's collection; in the eighteenth century, it was at Poggio lmperiale and, since 1773, it has been at the Uffizi. 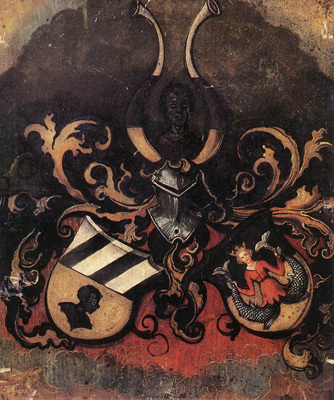 The coats of arms of the Durer and Holper families are depicted on the reverse side of the painting, with the date 1490 and the number 19 of the Imhoff inventory. The two panels were furnished with hinges so that they could be closed, one on the other: on one side, the coats of arms in front of the smoky clouds could be seen, and on the other, the devil who is taking shelter in the crack of a rock. 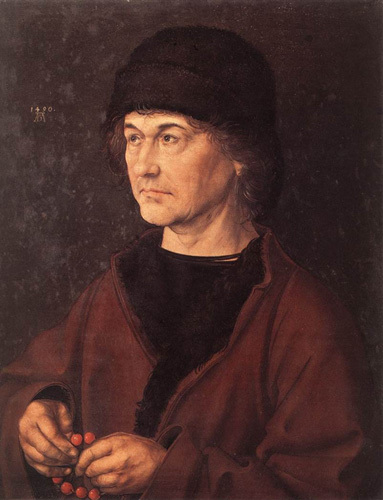 The nineteen-year-old Durer painted the portraits of his parents as soon as he finished his three-year apprenticeship under the woodcutter and painter Michael Wolgemut of Nuremberg (1490), and before undertaking his journey to Colmar, for Easter (April 11) of the same year. These are the first two documented panels of the young artist, and the oldest example of a diptych of portraits known in German art. The relief of the wrinkles of the hands, the length of the fingernails, the expressiveness of the moist gaze of the eyes—which reflects the window bars—the precise depiction of the eyebrows, and of the first hint of the beard: all these details indicate the immense talent of the still-young artist. The dimension of the head and the position, in the visual field, of the upper part of the body are also fruits of a wise, thought-out decision, which brings focus to the head, whether for the effect of light or for its relationship with respect to the dimensions of the painting. Together they create a delicate counterpoise with the joined hands. Before such pictorial sensitivity, the slight difficulty that the artist encounters in representing the shortened right forearm appears almost negligible. In comparison with the portrait of his mother, the one of his father is more characterized, and not only for the exterior aspect. According to Durer's description in the "Family Chronicle" of 1524, he was "a man, gentle and peaceful with whomever," and his sensitive nature also transpires from this image. In general, the portrait of the woman should not be to the left—for the spectator—of the man's, as it is in this case (compare the portraits of the Tuchers); however, other examples like this exist. In 1824, the two portraits were included in the inventory of the museum in the Jagerhaus of Weimar. After 1918, they were passed from the grand dukes to the museum. It was commissioned in the same year as the diptych of Nicolas and Elsbeth Tucher. 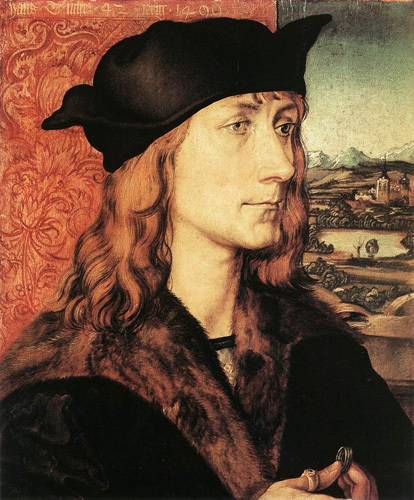 They had approximately the same composition because Wolgemut, Durer's master, had already done portraits of the members of the Tucher family years before. Even the setting of the portraits is very similar. The presence of an embroidered curtain in the background, the almost identical landscape passage seen through the windows, and lastly, the windowsill set equal spatial limits to the portraits. The foreshortenings of the landscape passage are imaginative and mannered, showing roads, lakes, and mountains. On the road, in the landscape behind the man's portrait, one discerns a wayfarer; on the path, in the woman's portrait, a man on horseback. The same clouds are seen in the clear sky behind the man, as in the wife's portrait, and in Elsbeth Tucher's. Hans Tucher, a descendant of an old Nuremberg family and an important member of the city council, is depicted in lavish clothes, with a fur collar, a symbol of his high-ranking position. The head, portrayed in a more elevated position than that of his consort, is framed by soft and wavy hair. The eyes, which have slightly different size, have an open gaze, the eyelids are somewhat lowered, the nose is long and sharp, the lips thin: the result is a proud but winning look, which is also emphasized by the points of the beret folded to the back and front. Besides the ring he wears on his thumb, he holds—like Elsbeth Tucher in her portrait—another ring, gold, in his hand as evidence of his marriage, contracted in 1482 with Felicitas. She, in turn, holds a carnation, with a bud and a flower. Her plump face is turned to the left, but her gaze, with slightly melancholic eyes, looks to the right. Like her sister-in-law, she wears a gold chain around her neck, and the waistcoat, according to custom, is held by a buckle, which is engraved with the initials of her consort, H. T.
The combined coat of arms of Tucher-Rieter is depicted on the verso of the Hans Tucher portrait, which became the anterior side of the closed diptych. In 1499, the brothers Nicolas and Hans Tucher (the latter a member of the city council of Nuremberg) have Durer execute their portraits and the portraits of their wives. In all likelihood, they had even determined the unusually small dimensions of the portraits and their characteristics with the artist: in a half-bust, holding a ring or flower. The background probably also corresponds to their wishes: a damask curtain, beside which a window opens sideways onto a landscape passage. 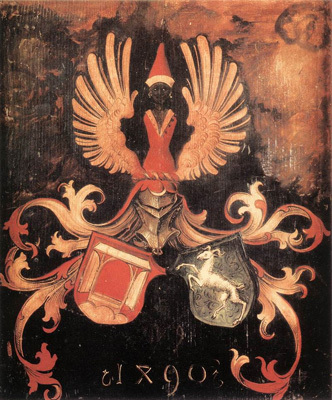 The missing panel, with the portrait of Nicolas, probably had the coat of arms of the families of both spouses on the retro, as did the example of the panel of the Portrait of Hans Tucher. The dimensions of the panels and the fact that they could be kept closed leads one to consider that they were not representative portraits, but rather, objects destined for the family archive. The twenty-six-year-old woman hides her braided hair under a bonnet with a net design, a sign of her status as a married woman. The head is portrayed in a three-quarter profile, in the act of casting an affectionate glance to her consort. The depiction of the face is delicate: the eyes-each different—have an absent expression; the cheekbones protrude slightly; the chin is firm; the mouth is well modeled; the skin color, suffused in a soft light, is rosy. The overall impression is of a portrait of someone with whom the artist had some kind of relationship, without, however, betraying any particular emotion. It is realistic, but not particularly meaningful. The bodice is held, according to the fashion (see the Madonna who supports Christ's hand in the Lamentation of Christ), by a gold clasp with her consort's initials, N. T., and has a heavy gold necklace running beneath it. Both the clasp and the necklace are gifts from her husband. The letters embroidered on the bonnet and the two Ws on the folds of the blouse, perhaps the initials of some motto, remain unexplained. 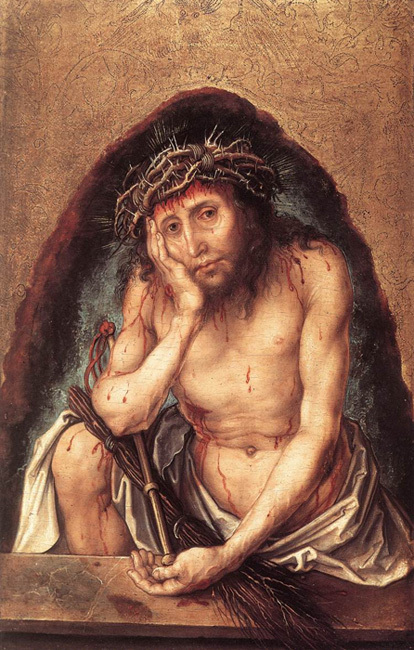 of Christ express melancholy and recall the self-portrait of Durer in a melancholic and tormented state of mind, drawn in about 1491 in Erlangen. Nevertheless, the small panel must have been created as a private devotional panel at the end of his journeys, about 1493 or 1494 (Anzelewsky, 1991). The twigs of thistle and the little owl, who is attacked by other birds, engraved on the golden background, have prompted different interpretations, the most probable of which is the Redemption of man the sinner through the suffering and death of Christ. As in the portraits, the head of Christ is of a distinguished workmanship, both for the formal and psychological profile; the painting easily lends itself to be used as a devotional panel. 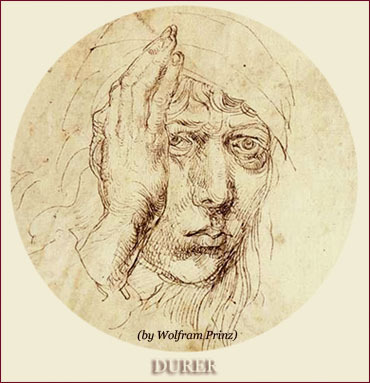 The third of eighteen children, Durer discovered, early on, his first artistic inclinations while training at his father's workshop for a three-year apprenticeship. He then entered, at age sixteen, the workshop of Michael Wolgemut, the painter and woodcutter; like other great artists, Durer was first a goldsmith and then a painter. At Wolgemut's workshop, altar polyptychs consisting of sculptures and large painted panels were executed. However, many were also done, which were then printed by Anton Koberger, Durer's godfather, a famous printer and editor of the time. It was the apprenticeship in wood engraving that was to leave a mark on the artistic development of Albrecht. At the end of this three-year apprenticeship, the nineteen-year-old Durer, unable to tolerate the limitations of Wolgemut's workshop, and determined to widen his horizons, set out auf Wanderschaft. At that time, and for a long time after, these so-called Wanderjahre (years spent wandering) were, in Germany, the "journeying" apprenticeship of every reputable artisan. And it was so in Durer's Germany, even for an artist from the artisan class. The Lehrling (apprentice) would pass to Geselle (worker), then to become Meister, that is, master, and thus, proprietor and owner of a workshop. 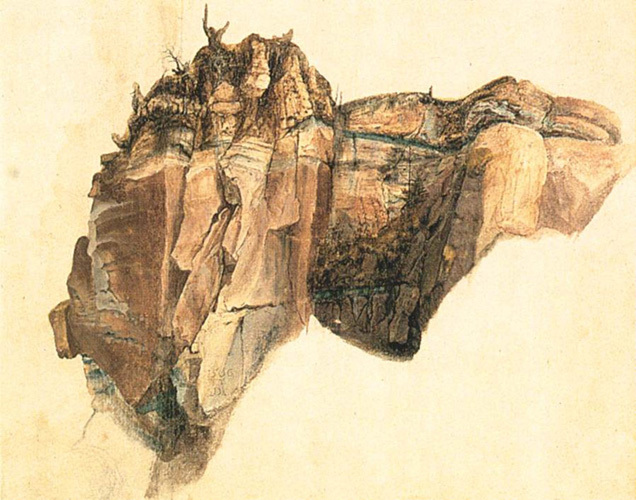 Durer did this, setting out along the upper Rhine. Certainly on his father's advice—who, in that period, had much influence on his decisions and artistic development in general—Durer made a stop in Colmar, in the workshop of Martin Schongauer, one of the most respected German painters and engravers of the age, who was also a goldsmith's son. Here he was to have stayed for another period of apprenticeship. Unfortunately, Schongauer died shortly before Durer's arrival; however, his brothers allowed the young artist access to his works, particularly to his drawings, a certain number of which he kept for some time afterward. He proceeded on, arriving in Basel in 1492, which at that time was an important publishing center. Here he could put to use his experience as a woodcutter, contributing with illustrations to Sebastian Brant's edition of Narrenschijf (stultifera navis), Terence's comedies and Ritter vom Turm. After a period in Strasbourg (see the Self-Portrait of Strasbourg), toward the end of 1494, Durer returned to Nuremberg. He had been away from home for four years. Unfortunately, we do not know if his Wanderschaft took him to the Netherlands as well, where his father had been as a young boy. It is very likely that he was in Cologne and Mainz. His return just three months away, the twenty-four-year-old Albrecht took, along with the conspicuous dowry of 200 florins, the hand of Agnes, the daughter of the artisan Hans Frey. She belonged to the well-to-do Nuremberg bourgeois and was an acclaimed harpist. This painting was probably part of the Imhoff collection in Nuremberg and subsequently—though it is not for certain— part of the collection of Emperor Rudolph II. After passing through various private hands, the last being L. Goldschmidt of Paris, it became part of the Louvre collections in 1922. The very eloquent inscription, "my affairs are ordained from Him above," is expressed in an idiom that resembles the Alemannic-Alsatian dialect (Rupprich, 1956, I, p. 211 n. 6). This is not surprising, since at that time (1493), during his early Wanderjahre, Durer would have been in Strasbourg. This would also be supported by the fact that it is a painting on parchment, an easily transportable material. Goethe, who had seen a copy of the painting, had already recognized in the drawing that the youth holds a sprig of sea holly (Eryngium) in his hands, whose current German name is Mannestreu, or Mannertreu, that is, "fidelity of man." This name consequently provoked diverse interpretations as to its presence in the painting. Thausing (1876/84) insists on seeing a request for marriage in the gesture of offering the plant. From the times of Pliny (Willnau-Giessler, Zeitschrift fur bildende Kunst, 1930), sea holly had been a sign of conjugal fidelity. 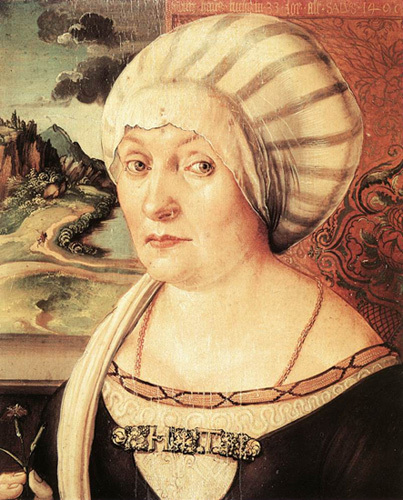 Durer would have painted the portrait for Agnes Frey, who was betrothed to him, as arranged by their parents. Ludwig Grote finds a link between the plant and the inscription and proposes a religious interpretation, tied to the Passion of Our Lord. Edgar Wind (Giorgione, La Tempesta, 1969) sees in the plant an allusion to the fortuna amoris or even to the constantia amoris, recalling that the plant was present in the engraving Nemisis (or Fortune) as well. However it may be, the presence of the sea holly, given the prominence Durer assigns it, has an important significance. 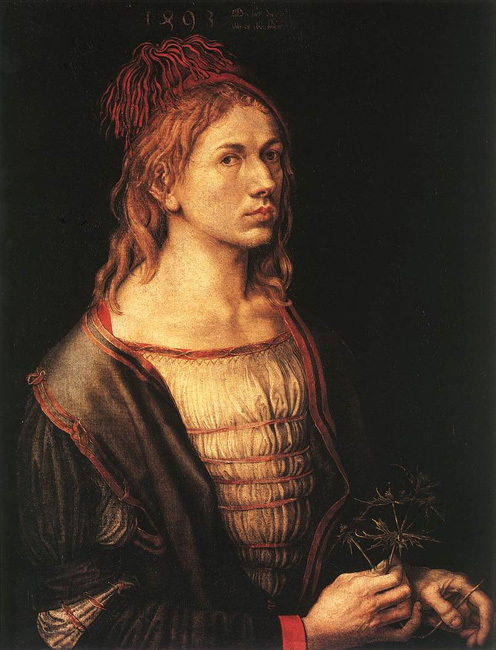 Before painting this excellent self-portrait, Durer, from the age of thirteen on, had already executed four others. Two of these, from his Wanderjahre period, are drawings in half-length. He is portrayed in all of them with his head covered, but in the Paris portrait, for the first time he chooses a showy, fashionable headgear: a red beret with a cluster of red ribbons, worn on a slant, as if from force of habit. The long blond hair falling to his shoulders is similarly studied. On the shoulders, we find a garment with a red and gold hem draping over a shimmering white blouse whose pleats are gathered by many decorative ribbons. We also see the sleeve puffing at the right elbow. So much refinement in attire does not reveal Durer as he was at that moment, a wandering painter and a novice without his own workshop; he represents himself in the portrait much better dressed than he would have been. He is represented here not how he actually was, but rather, how he visualized himself in the society where he wanted to be. Only the fixed gazed reveals the artist who is portraying himself, because only in this way would he see his eyes in the mirror. The beauty of the mouth hints of Durer's still-present vanity. In contrast, the pronounced nose and the not-so-beautiful hands (the left one has been painted over; Winkler, 1957; Strieder, 1989 suggests that it is a later supplementation) already reveal his realism and precision as an observer. The heavy varnish unfortunately compromises the original brilliance of the color scheme. This painting, a self-portrait at twenty-two, represents, with the exception perhaps of Jan van Eyck and Leon Battista Alberti, the first and most significant "autonomous" self-portrait—that is, an image unto itself and removed from the context of European art. A few months after his wedding, the plague broke out in Nuremberg. Following doctors' advice, Durer left the city as a precaution. He crossed the Alps, passing Augsburg, Innsbruck, and Trent, to reach Venice, which was then an important trading center; the German merchants had their own flourishing colony and owned the "Fondaco dei Tedeschi." 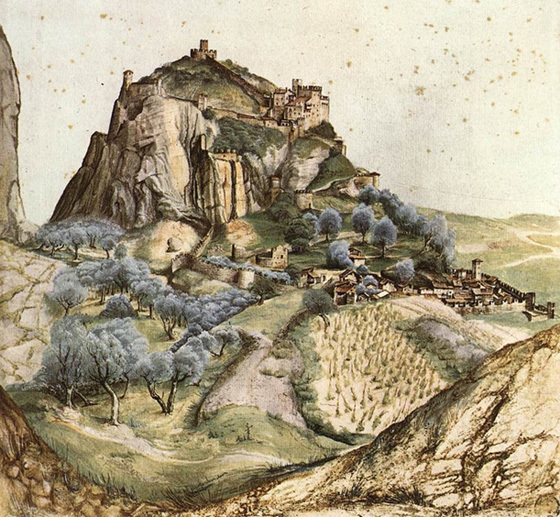 During his trips, Durer painted numerous and very beautiful watercolors with landscape and architectural themes, watercolors that—thanks to his technique (which was adopted, before Durer, only by a Wolfgang Katzheimer the Elder in his scenes of Bamberg, as far as we know) and their exquisite execution—can be considered among the most beautiful works by the artist. Presumably, the German merchants of Venice introduced Durer into the artistic circles of the city. He naturally frequented Gentile Bellini's workshop, while the latter worked on the Procession of the Relics of the Cross in Saint Mark's Square. This is demonstrated by a drawing with three Turks and one Moor, evidently taken from that painting, which was not yet completed. In Venice, he painted devotional images and contemporaneously executed copies of some of Mantegna's and Antonio Pollaiolo's engravings and of Lorenzo di Credi's drawings. In the meantime, he carefully observed all that surrounded him—people, animals, and things—as ine drawings of the clothes of Venetian ladies, the costumes of the Turkish figures, and the famous Sea Crab (eriphia spinifrons), besides the portraits, all bear witness. As published by Longi in 1961, this painting was located in Bagnacavallo, in the monastery of Capuchins nuns founded in 1474; evidently, it has not left Italy since Durer's time. The cloth that wrapped around the child's hips was considered a posterior addition and has been removed. Longhi and Musper dated the work to Durer's second trip to Italy (1505-6). The catalog of 1971, as well as Anzelewsky, comparing it with various drawings of the artist, date it to his first sojourn in Italy (1494-95), and, more precisely, before the Haller Madonna, a date that seems much more probable. Strieder has it painted in Germany, in the period after the painter's first sojourn in Venice. The small image of the Madonna, like that of a private devotional panel, is painted, as Anzelewsky rightly observes, in the Florentine style, in a three-quarter figure. The Madonna is seen through a window, with one side of the frame and the window sill projecting out. The marble wall that stands behind the Madonna is interrupted by an arched doorway, which, standing open, gives way to another brick wall, illuminated from above. Between the Madonna and the back wall is a shallow space, typical of all Durer's early works. The Madonna, young and graceful, with long curls, wears a red gown and a blue cloak. She delicately holds the infant in her lap, like a most precious treasure. She looks downward and smiles gently, her eyes still lowered, enraptured. The infant, delicately shaped by the effects of the light, is anatomically perfect; his rapt gaze is facing upward, toward his father. In his right hand, he holds a small strawberry stem, which may symbolize the incarnation of Christ (Levi d'Ancona, The Garden of the Renaissance, Florence, 1957). The small feet, one placed over the other, foreshadow the Crucifixion; the dangling right arm recalls the deposition and the lamentation; the white cloth, the sudarium. Through the symbolic attributes and the expressiveness of the gestures, the image suggests to the faithful to contemplate the theme of the incarnation with that of the Passion. These eventualities are foreseen and accepted by the humble pose of the Virgin Mary.